The natural makeup and warmth in the texture of wood flooring in Glendale are some of the reasons why many people want to get wood floors installed in their homes. There are a lot of people who would do anything to have wooden floors. In as much as wood is an incredible flooring option, there are some challenges that you need to be aware of and find ways of mitigating. With wooden floors, it is always wise to think ahead of time so that you can actually love the outcome you are working towards. When thinking about Glendale wood flooring, you need to also think about the moisture problem. The biggest challenge for wooden floors is, in fact, moisture and exposure to water. The cells that make up wood are naturally hygroscopic. This means that if water spills on them, they will absorb the water and expand. This expansion is not only applicable to water spilling on your wooden floors, but it is also associated with the humid seasons. During the cold season, the wood will contract. You, therefore, must notice that when the contraction and expansion happen rapidly, there will be no more space, which results in the floor cupping. In order to avoid most of these problems with wood floors in Glendale, it is always wise to hire an expert to help with the installation. There are a lot of people who can handle that for you, but for the best results, ensure you hire a professional to install and take care of your wood floors in Glendale. The experience that they have in the industry is something that you will definitely come to appreciate, which makes your work easier in the long run. What is the proper maintenance procedure for wood flooring in Glendale? Generally, wood flooring in Glendale and water will never go hand in hand. Even if you get the kind of wood that is properly treated to withstand the effects and impact of water, you should never allow a puddle of water or any fluid for that matter to stay on your floor for long. Water will eventually seep into the wooden floor. When this happens, your floor will expand unevenly upon the absorption, and this makes it easier to start chipping. To be on the safe side, wipe away any spills on the wooden floors as soon as possible. How important is polishing and varnish for wood floors in Glendale? 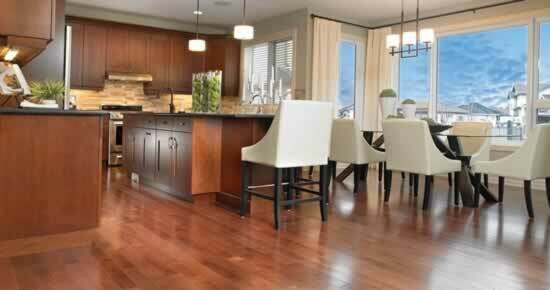 Polishing your wood floors in Glendale is a good way to make them look good for a very long time. There are a lot of situations where you might have come across wooden floors that look almost new, yet they were installed many years ago. The secret, as you will come to learn from most of the homeowners, is that they basically keep their floors polished frequently and apply varnish whenever necessary. This will help maintain that glamorous luster for years. Must I follow the manufacturer’s instructions with Glendale wood flooring? The manufacturer's instructions on maintenance are important. Most people barely look at them and end up damaging their Glendale wood flooring. You should follow these instructions to the latter, so that in the long run, you will be in a good position to get nothing but the best results. These instructions are provided after careful study and research into the unique blend of wood that you have obtained for your floors. You, therefore, need to take the instructions seriously so that the floor remains in perfect shape for a long time.